Health care in America is in crisis. Population health and patient outcomes are deteriorating relative to the rest of the developed world, and much of the health care delivered today is not based on rigorous scientific evidence. This is attributable, in large part, to a failing clinical research enterprise. From the perspective of patients and the general public, science rarely answers questions that “matter”; the public’s trust in medical science is eroding; and patients often lack a clear understanding of the necessary role scientific research plays in all medical innovations. From the perspective of many practicing physicians, clinical research is burdensome, time-consuming, and costly. The pressures of day-to-day practice provide little opportunity for physicians to gain complete knowledge of the current universe of clinical research in order to understand how participation might benefit their patients. From the perspective of health systems, clinical research is often seen as a costly distraction from the primary patient care mission. And while advancing science is an oft-stated goal, it is no substitute for increasing clinical volumes, especially in challenging economic times. Absent a strong business case, health system leaders have little incentive to invest in clinical research infrastructure or capacity-building. Despite these challenges, our need for scientific evidence that can be rapidly implemented into clinical practice has never been greater. By 2025 the U.S. population will resemble the population of Florida today. There will be as many walkers as strollers. One in four persons will be older than 65. Population disparities (age, racial and ethnic identity, gender, geography) will widen. The prevalence of chronic diseases and obesity will continue to escalate and will further erode the public’s health. This current trajectory screams for disruptive transformation of the clinical research enterprise. First and foremost, such transformation must address two fundamental and interrelated deficits: a knowledge deficit and a human resource deficit. Indeed, absent an educated and robust research workforce, the United States cannot realize sorely needed advances in health and quality of care. The clinical research workforce of the future must advance human health within a highly complex and rapidly changing social, economic, political, regulatory, and scientific environment. To do so will require fundamentally different skills and capabilities. Preparing this workforce for the challenges ahead calls for an entirely new educational paradigm. Essential attributes of a new education model for clinical research are described in Box 1 and could include patient-centeredness, stakeholder engagement, team science, a “glocal” perspective, integration, collaboration, a focus on value, and/or a rapid-cycle learning and implementation ecosystem, delivered through flexible, dynamic, IT-enabled educational curricula, and guided by a comprehensive set of core competencies. Patient-centeredness: meaningful public engagement in all phases of clinical research, from conception of a research question to design, conduct, analysis, and dissemination of the findings. Broad stakeholder engagement: understanding and incorporating perspectives of all relevant health care stakeholders, including patients, providers, payers, industry, academia, government, regulators, etc. Team science: creating scientific teams that can draw on the broad range of traditional biomedical research capabilities, from basic to implementation science, as well as skills less commonly associated with biomedical research, such as bioinformatics, systems engineering, economics, social and behavioral sciences, communication, and business/management skills. “Glocal” perspective: considering a wide range of insights from the local community to the global community. Integration: ability to integrate clinical research knowledge both across and among disciplines (see “Team science,” above), as well as across sectors (e.g., industry, academia, government) and, importantly, also between clinical research and practice. Collaboration: creating alliances among clinical researchers and policymakers, community leaders, patient advocates, industry, government, regulatory bodies, and others as necessary, in order to fully understand and most effectively address broad societal needs. Value-focused: advancing the potential of clinical research to improve health outcomes while simultaneously lowering (or at least stabilizing) health care costs. Rapid-cycle learning and implementation: facilitating new approaches and technologies to accelerate the implementation of scientific evidence into practice, evaluate outcomes, and generate new hypotheses in rapid-cycle learning systems. Flexible, dynamic, and IT-enabled educational offerings and curricula: creating formal education programs, training methods, and lifelong learning opportunities with the ability to adapt to changing health and research needs. A dynamic educational framework will be necessary to train the next-generation clinical research workforce. attributes above to guide the educational transformation. The November 2011 Institute of Medicine (IOM) workshop Envisioning a Transformed Clinical Trials Enterprise in the United States: Establishing an Agenda for 2020 underscored the central role for education of the workforce in driving the transformation of the clinical trials enterprise (IOM, 2012). The components of an education model for the clinical research workforce, described above, would also apply to the clinical trials workforce—theoretically a subset of the broader clinical research workforce. The workforce for a transformed clinical trials enterprise, as envisioned in the IOM discussion paper Developing a Robust Clinical Trials Workforce (Bonham et al., 2012) and workshop conversations, was all encompassing, including not only academicians and clinical trials investigators but also clinical trials implementers, health care providers, and the public at large (see Figure 1). With broad engagement, shared commitment, and shared accountability among all segments of this workforce, the redesign of clinical research education proposed herein can catalyze a transformation in medical and translational research that can effectively and efficiently improve human health for all. Bonham, A., R. Califf, E. Gallin, and M. Lauer. 2012. Developing a Robust Clinical Trials Workforce. Discussion Paper, Institute of Medicine, Washington, DC. IOM (Institute of Medicine). 2012. 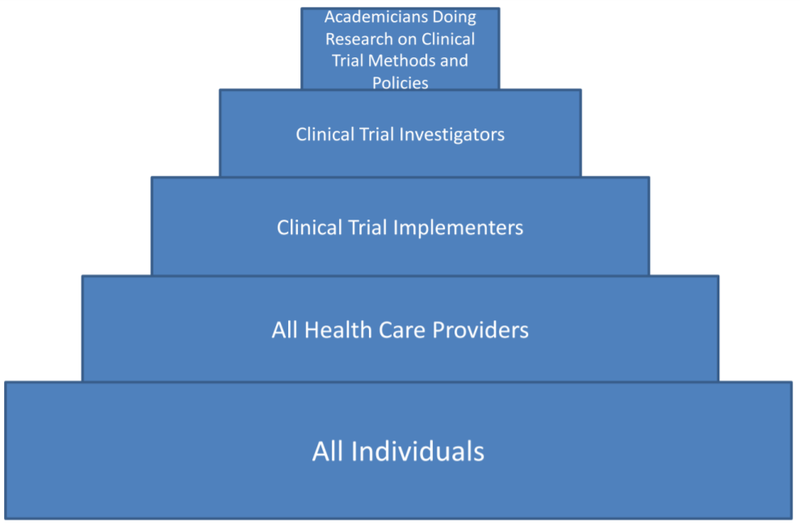 Envisioning a Transformed Clinical Trials Enterprise in the United States: Establishing an Agenda for 2020: Workshop Summary. Washington, DC: The National Academies Press. http://www.nap.edu/catalog.php?record_id=13345 (accessed April 13, 2012). Sherine E. Gabriel is professor of medicine and epidemiology at the Mayo Clinic and chair of the Patient-Centered Outcomes Research Institute’s (PCORI’s) Methodology Committee.